Ah, finally, my August giveaway! 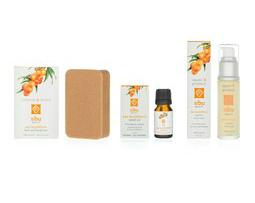 I am excited to review and giveaway a set of products by Sibu Beauty. I was doing some research on naturally-based skincare, and ran across the company online. I purchased a kit for myself to try, and was eager to see if Sibu Beauty's key ingredient, the Sea Buckthorn berry (harvested from the Tibetan Himalayas), would live up to its hype. In my opinion, it did. I have combination skin, but I don't usually deal with acne on a daily basis. My biggest skincare concern is redness. This skincare regimen really made a noticeable difference in the redness I experience as well as my overall skin tone. I also used these products on my arms (where I also experience redness and uneven skin tone) and found that I was extremely pleased with the results, even more so than the results I noticed on my face). The soap and moisturizer have a pleasant, light, citrus-y scent and the moisturizer feels very light on the skin. Definitely a plus. Now, let's talk about the oil for a moment. If there is one thing I would tweak about this skin care kit, it would be the oil's scent. It is unlike anything I've ever smelled, so I'm not sure what to compare it to. The closest thing I can think of is a very strong herbal tea. It's not instantly terrible, but it's definitely strong. However, the amazing things it does for my skin is such a benefit (and it's really cleared up any little patches of eczema that Miles had previously) that I don't really mind. Time for the giveaway! I'm offering one reader the wonderful Facial Cleansing Kit which includes the Cleansing Face and Body Bar, the Sea Buckthorn Seed Oil, and the Nourishing Facial Cream. Sibu Beauty has also generously offered another reader the Seed Oil. 1. Follow Joie de V via Google Friend Connect. 2. Take a moment to visit Sibu Beauty's links below. 3. Enter the giveaway via Rafflecopter. The giveaway will be open until August 21st, and I will contact the winner by email. Good luck! Liked you on Facebook. Operation Fabulous sent me. I'm TOTALLY on board with the natural skin products! I'd love to win this and especially the hydrating serum. Need to get that moisture back! I'd like to try the Seed Oil! I'm visiting from Naptime Review's Operation Fabulous. Is this giveaway open to Canadians? Just checking! Oh, I forgot, I'm now following you via GFC! @ Renee: Yes, it is! :) So excited to connect with you! I'd like to try the Sea Buckthorn Rejuvenating Night Cream! I'd love to try the hydrating serum!! I'll definitely have to check out the product line. Sounds great. Thanks for sharing. I'd love to try a new cleanser! 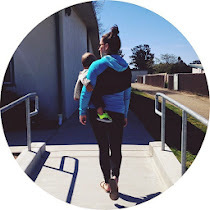 I'm so glad you camy by my blog today! What a fun giveaway, thanks!! I am visiting from Operation fabulous from Naptime Review. I am now following. It would be great if you would follow me back. This is such an awesome give-away. I'd love to try the oil, I always find them so good for my skin. I'd love to win the hydrating serum! Thanks for having this awesome giveaway! What a cool giveaway! I will have to check out their line. It sounds like we have very similar skin issues! I get so red! Thanks for dropping by my blog!! I can't wait to read more. Fantastic giveaway! I would love to try the cleansing face and body bar. Also, Thanks so much for the follow and the awesome comment you left! Following you back now as well :) Have an excellent day! I'm most excited about the facial cream! the facial cream sounds awesome!! !